Seeding and Placement is made from a single interface where you can add participants into the phase (because all participants don't have to start in the first stage of a tournament, or play all stages) with a multi-selection modal window. A seed is then attributed to them depending on the order you picked them. 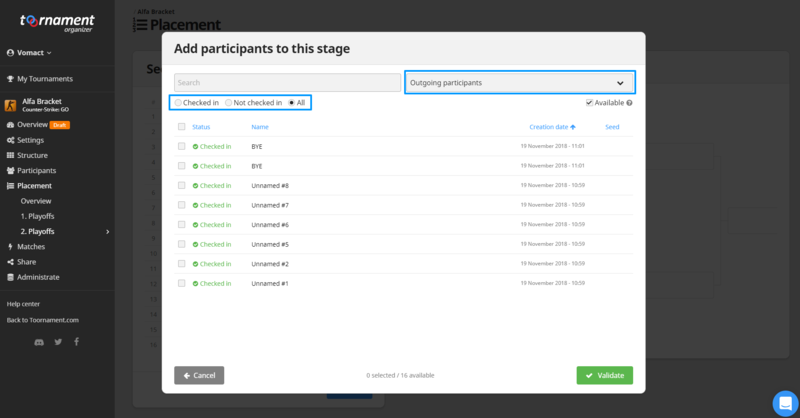 Note that the modal will see a new Outgoing Participants filter appear in the case of a multi-stages tournament, allowing to only see participants coming out of another phase, in ranking order, to simulate continuity between phases and ease up the process of selecting participants one stage after the other. It is to be noted that you can also filter your participants depending on their Check-in status. You can also lock some of the participants in their attributed seeds. This serves one major purpose: locked seeds won't change if you randomize the participants into the stage, meaning you can have seeds stay in place while you randomly add participants into the stage. Furthermore, re-generating a stage (by changing its size for example) does not alter the seeds, meaning all seeded participants will keep their seeds, and locked ones will remain locked. This interface is a preview, meaning you can edit things, try and test things out, but ultimately, nothing changes until you save. With this new system, it is still possible to manually place each and every participant, either all at once before starting your tournament, or step by step, even after the stage matches have started (but a participant with a result in one of its matches will become locked).